8GB Kingston Mobility/Multi Kit. Kit includes: SDC4/8GB, MRG2, with microSD to SD adapter. 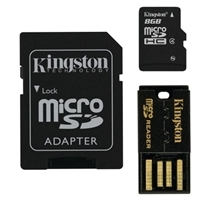 Kingston MBLY4G2/16GB 16GB Mobility/Multi Kit. Kit includes: SDC4/16GB, MRG2, with microSD to SD adapter. Kingston 16GB Multi Kit / Mobility Kit. Kit includes: SDC10/16GB, MRG2, with microSD to SD adapter. 32GB Multi Kit / Mobility Kit. Kit includes: SDC4/32GB, MRG2, with microSD to SD adapter. Kingston MBLY10G2/32GB 32GB Multi Kit / Mobility Kit. Kit includes: SDC10/32GB, MRG2, with microSD to SD adapter. 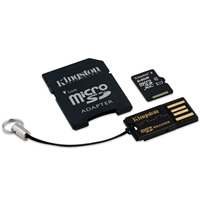 Kingston MBLY10G2/64GB 64GB Multi Kit / Mobility Kit.